Panvati, or Panoti, is a woman mentioned in Hindu scriptures and she symbolically represents the all the bad astrological influences caused by the Navagrahas or nine planets. The most popular image of Panvati is that of Hanuman trampling on her and holding her hair. As per Hindu astrology or Jyothi Shastra, the Navagrahas play very important role in the fate of a man. The good alignment of nine planets is very important for prosperity and peaceful life as per horoscope. But usually the planets are never in good alignment and cause lot of trouble and these troubles are symbolically represented by Panvati. The popular belief is that Hanuman has the power to overcome the Navagrahas. Therefore people pray to Hanuman to find solutions to troubles caused by the nine planets. 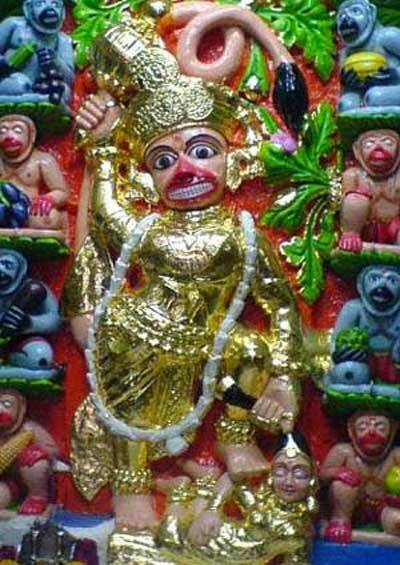 Thus Hanuman overpowering Panvati represents his ability to keep the Navagrahas under check and help his devotees.